Sign up for Broadjam today to follow John Hoskinson, and be notified when they upload new stuff or update their news! John Hoskinson is a Los Angeles based singer/songwriter in the tradition of Pete Yorn and Rhett Miller. 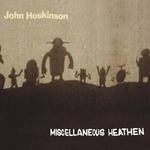 Mixing a pop sensibility with a knack for capturing the essence of relationships, Miscellaneous Heathen brings to mind many influences, including Neil Finn, Mike Viola, Jeff Lynne and The Gin Blossoms. The sign around his neck says "Hi, I'm Swedish"
"Send me to Omaha, I speak no English"
Now, you are the only one who thinks it's funny, too. And dare I say, I love you more each day? Should I tell him about me..